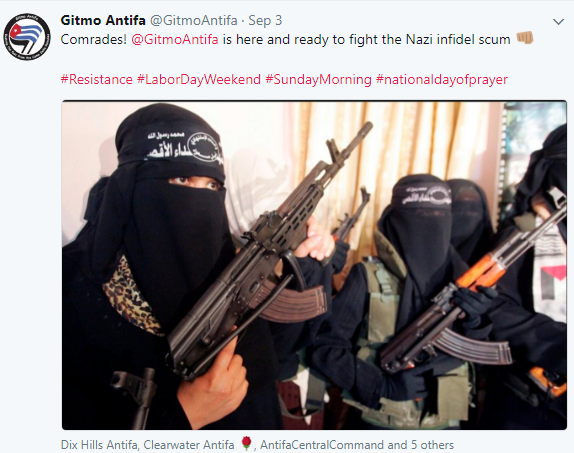 Since August 2017, I have cataloged hundreds of troll accounts linked to the Fake Antifa campaign, a loosely coordinated right-wing operation that impersonates antifascists on Twitter, Facebook, Gab, and other social media sites. Now, I’d like to share what I’ve learned about these trolls in a guide to spotting them on social media. 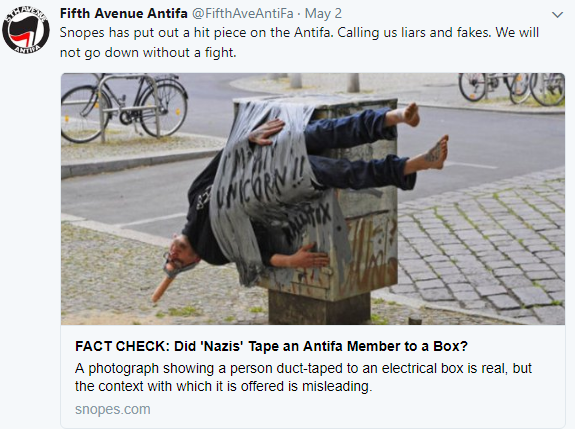 This article is divided into five questions that should be asked when evaluating the legitimacy of an alleged antifascist account. Each section contains screenshots and links of these trolls in action. 1. Does the account claim it’s located in Russia? If the account claims to be somewhere in Russia, stop. 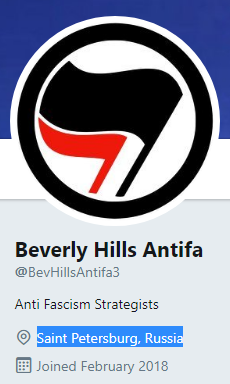 This is perhaps the most obvious sign that the account you’re looking at is not a legitimate Antifa account. 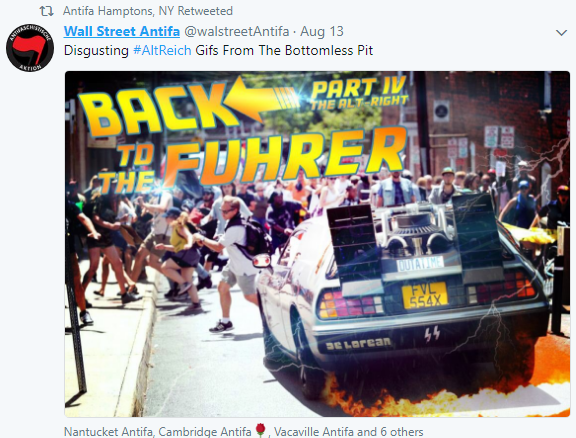 In an attempt to amplify the fear of Russian social media warfare in the United States, multiple fake Antifa accounts changed their geolocation to Russia after September 2017, when the now-suspended Boston Antifa account was infamously “busted” for tweeting from Vladivostok, Russia. The alleged revelation was eagerly covered by digital media outlets including, but not limited to, ThinkProgress, Vice News, and Buzzfeed. The Twitterverse, too, exploded in conversation about the discovery. 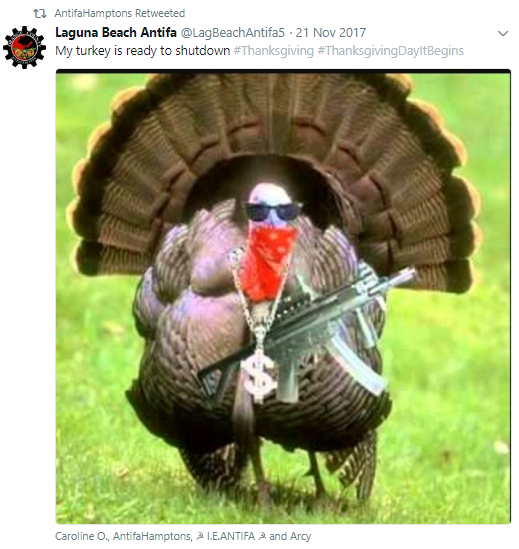 Many, if not most, claimed that this was proof that the account was run by Russian trolls. Meanwhile, others were more calm and pointed out that anyone could change their location on Twitter. 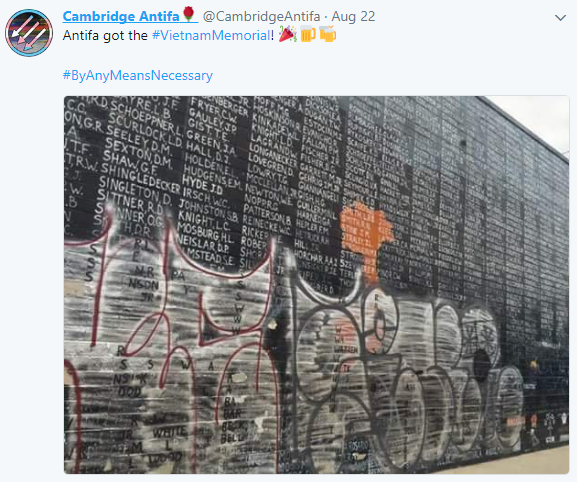 But regardless of who really managed Boston Antifa, fake Antifa trolls noted that a simple yet controversial location change to Russia stoked a massive frenzy on social media and thus further divided the American people. And so they did just that. 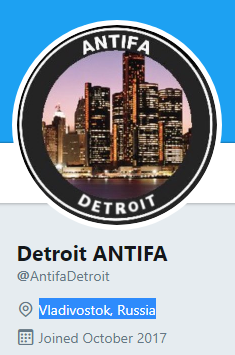 Since the Boston Antifa fiasco, multiple troll accounts claim to be located in Saint Petersberg, Moscow, The Kremlin, and other Russian locales. 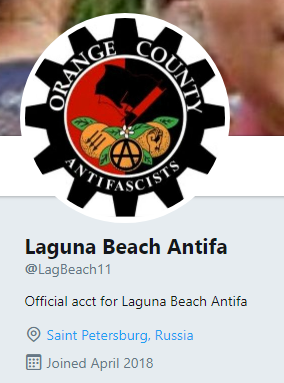 In sum, alleged Antifa accounts claiming to be located somewhere in Russia are fake. 2. Who is the account following? 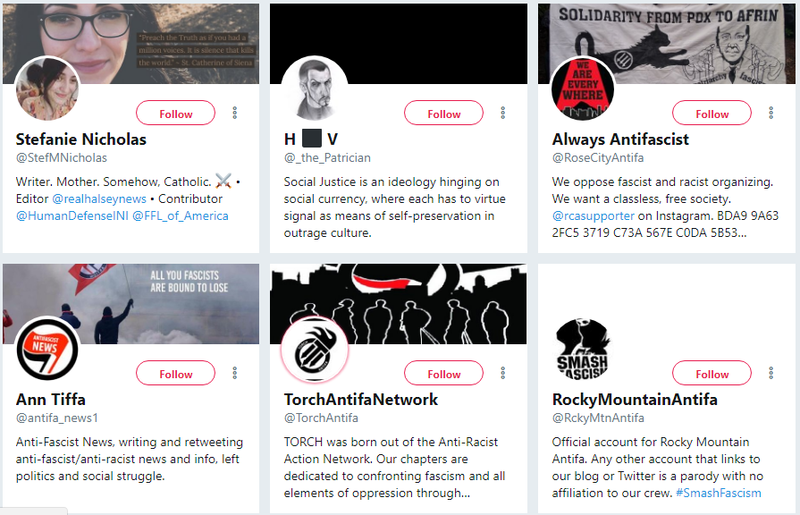 Let’s take a closer look at who Jessica Antifa (@AntifaJessica) is following. 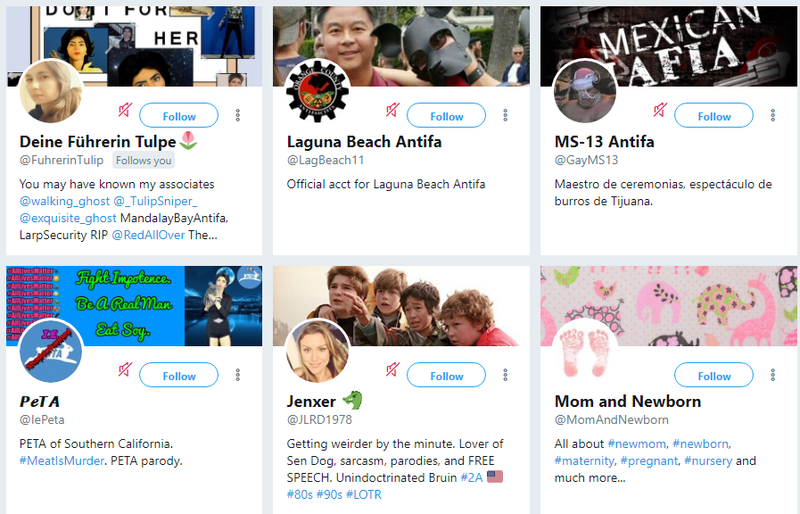 Below, you can see that the account follows multiple trolls like MS-13 Antifa (whose handle is @GayMS13), PeTA (who admits is a “PETA parody”), and Laguna Beach Antifa (@LagBeach11), a troll account present in the aforementioned list. 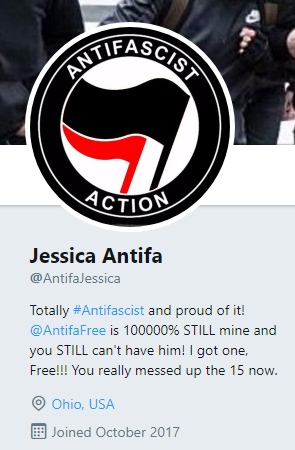 These are all red flags that Jessica Antifa is a fake Antifa account and not “totally #Antifascist” as they claim to be. 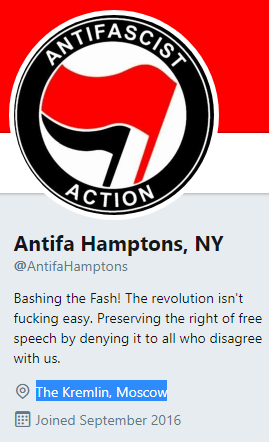 I mean, think about it: No legitimate antifascist that wants to be taken seriously will follow these types of people. 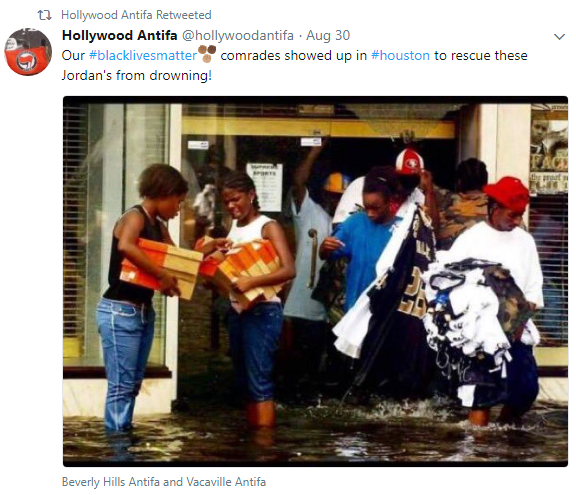 They are in the business of mocking others and sharing incendiary content. 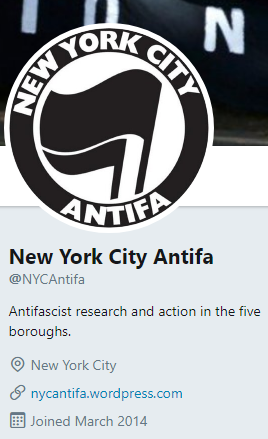 Now, let’s examine who New York City Antifa (@NYCAntifa), a legitimate antifascist account verified by Antifa Checker, is following. 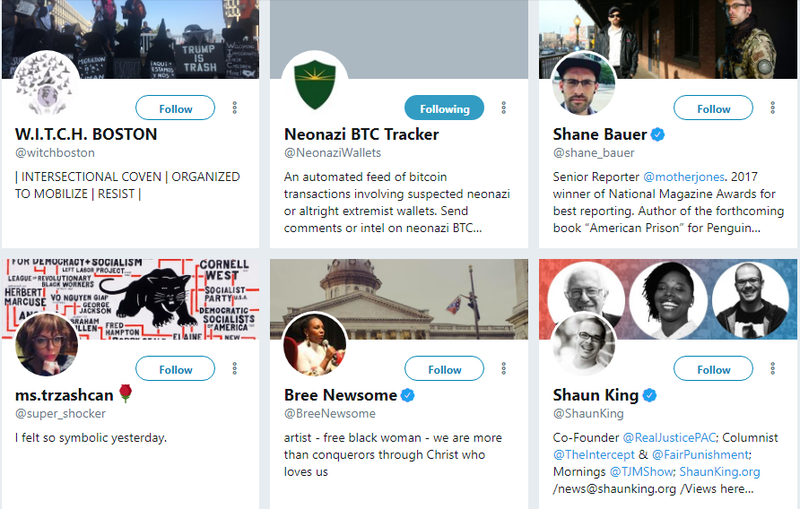 Below, you can see that they’re subscribed to a combination of journalists (@aflores), activists (@RVAwonk), activist groups (@HollerNetwork), and an anti-neo-Nazi service (@NeonaziWallets). By checking who an account follows, we can see how seriously the account considers itself to be. 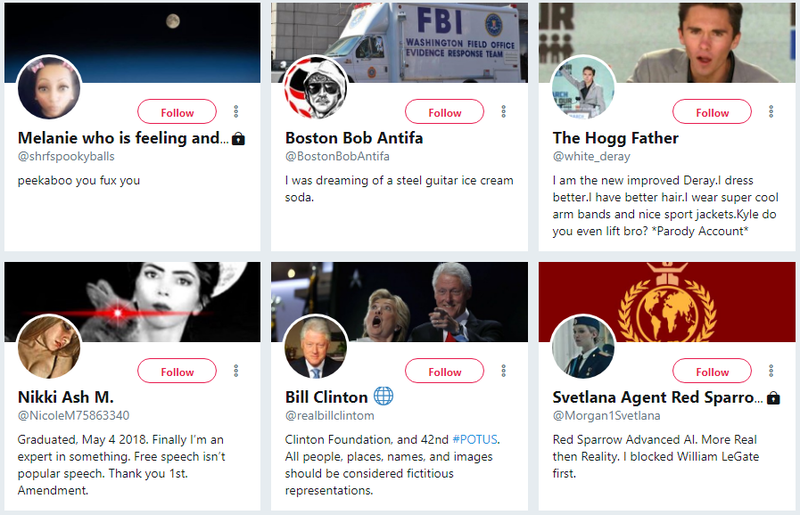 That said, fake Antifa accounts also follow real ones in an attempt to mask their illegitimacy. 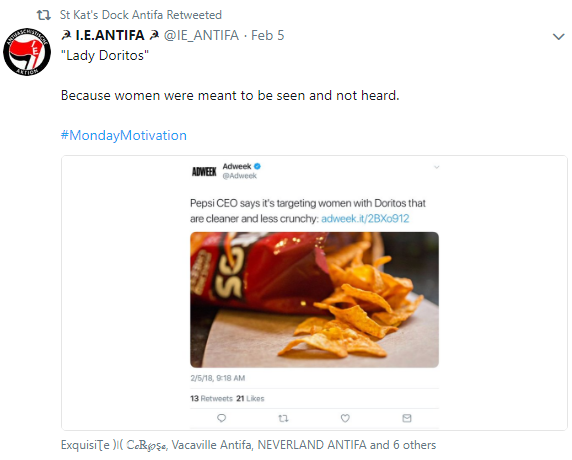 One example of this is Bay Area Antifa (@AntifaBay), an account that follows legitimate accounts like Always Antifascist (@RoseCityAntifa) and TorchAntifaNetwork (@TorchAntifa), but also follows trolls like The Hogg Father (@white_deray), Bill Clinton (@realbillclintom), and WokeASF_Feminist (@UglyWomen_Unite). You know the phrase “you are what you eat”? The same logic can be applied to troll accounts: They are who they follow. 3. Who is following the account? 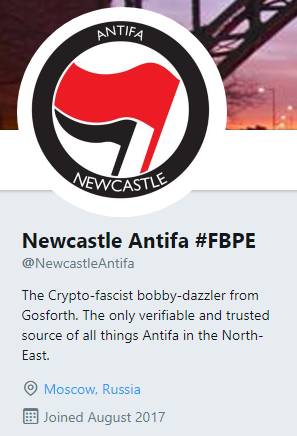 A strong sign that an alleged antifascist chapter/cell account is fake is if it’s not followed by Antifa Checker (@AntifaChecker), an acclaimed verifier of antifascist accounts. 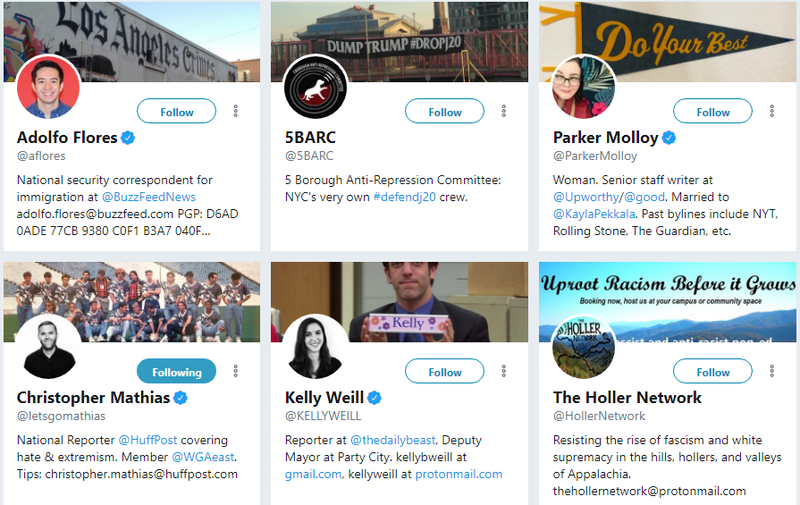 They’re followed by journalists, activists, and social movement organizations around the world, so they’re a reliable source in these trying times. Additionally, you should check the followers list of the account you’re looking at. 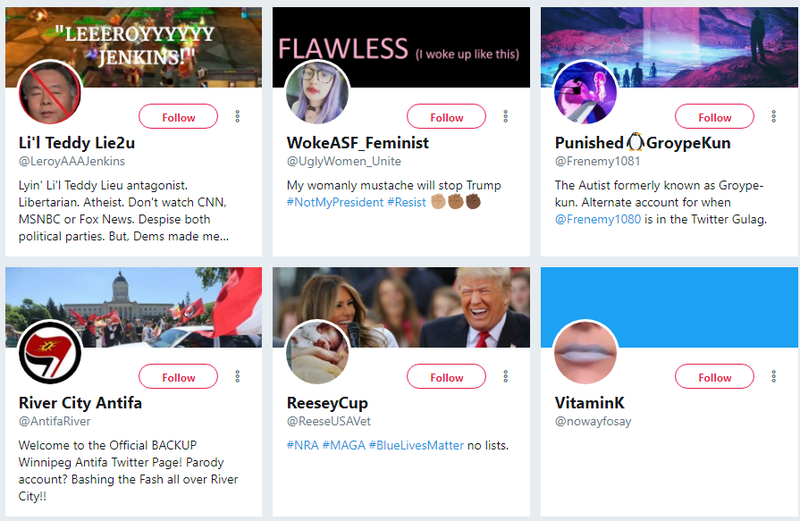 A good rule of thumb is that if they’re followed by right-wing accounts (pro-Trump, alt-right, Groyper, etc.) 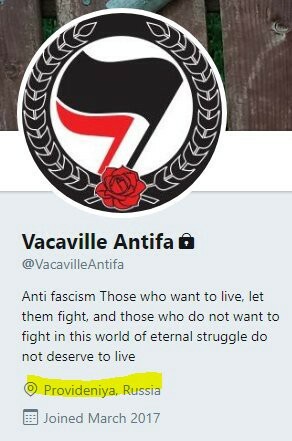 and/or fake Antifa accounts, they’re most likely to be fake. 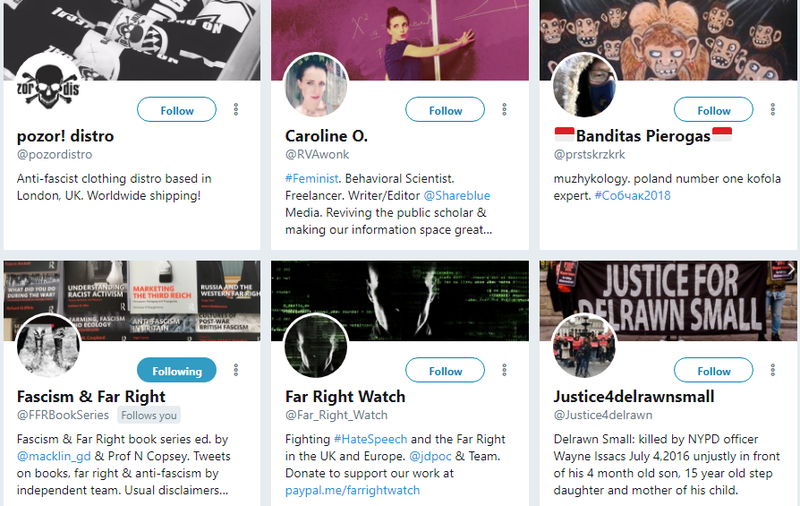 On the other hand, if an account is followed by numerous (verified) activist organizations and journalists, you’re almost certainly looking at a real Antifa profile. 4. What type of content does the account post? 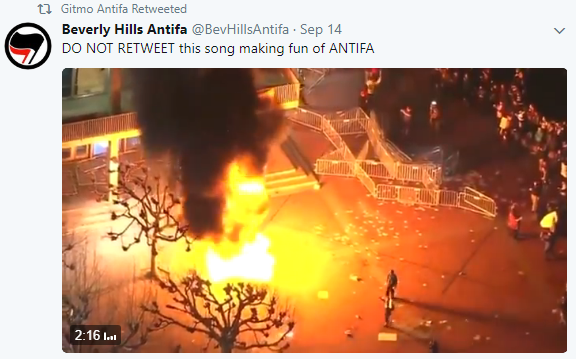 Other tweets are more dangerous, like their past attempts to link the antifascist movement to crimes and mass shooters. 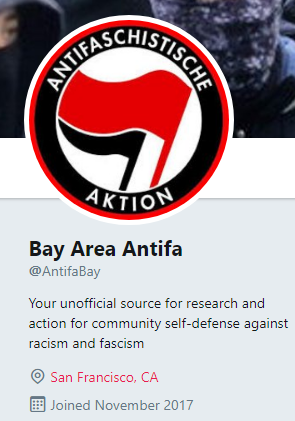 Another red flag is if the account mentions AntifaArmy.com or another fake Antifa profile in their bios. In sum, if you see any of the above in an alleged antifascist account, tread lightly. 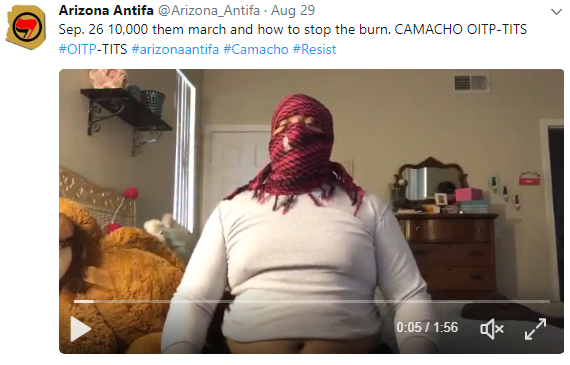 These trolls want people, especially rightists, to think Antifa activists are stupid, immature, criminal, hypocritical, and eager to use violence. 5. Who does the account retweet/tag? 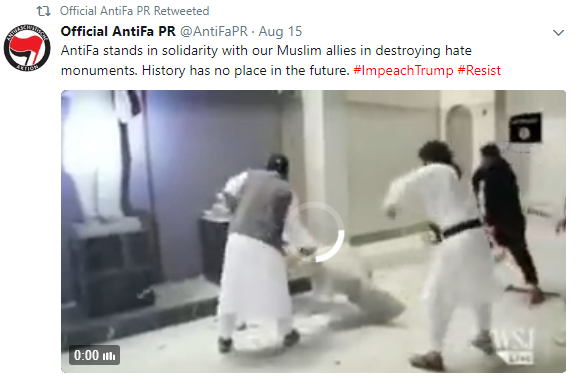 Who the account retweets and/or tags in photos is another indication of who they really are: Fake Antifa accounts tend to share content by right-wing profiles and other fake antifascists. 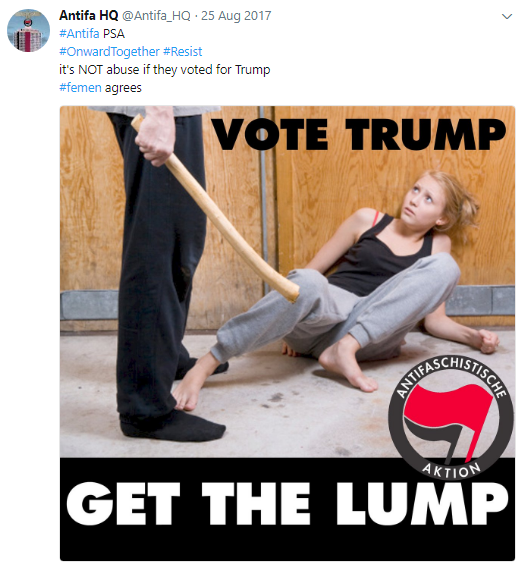 For instance, on January 3, 2018, The Real ANTIFA (@RealAntifa101) retweeted a pro-Trump profile. 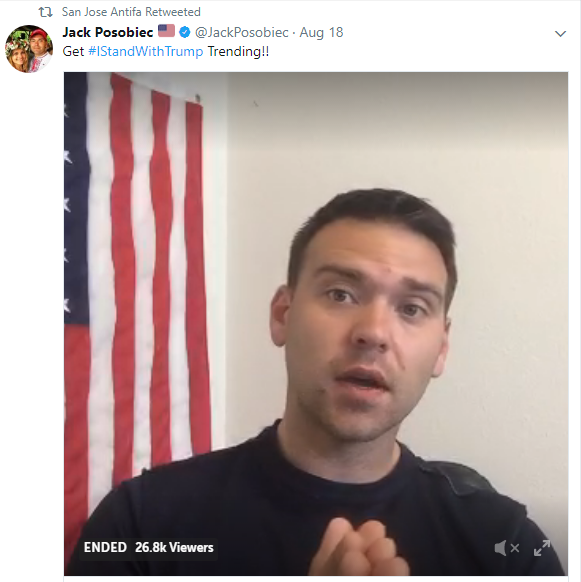 On August 18, 2017, San Jose Antifa (@SanJoseAntifa) retweeted Jack Posobiec, an alt-right media figure. Also, note the use of the hammer and sickle figure in IE’s profile name. 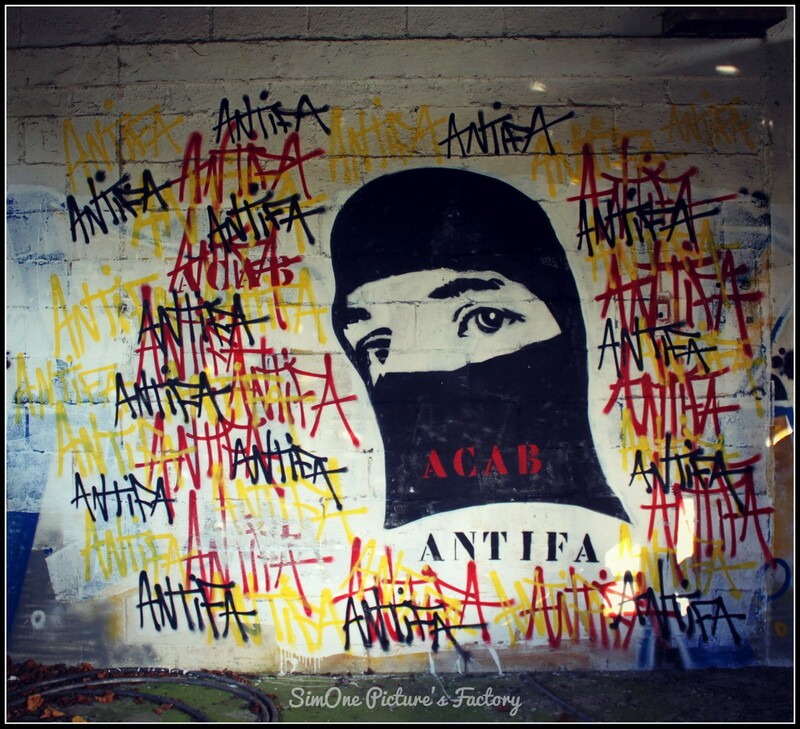 Fake Antifa accounts like to use communist symbols and rhetoric in order to spread fear among rightists. 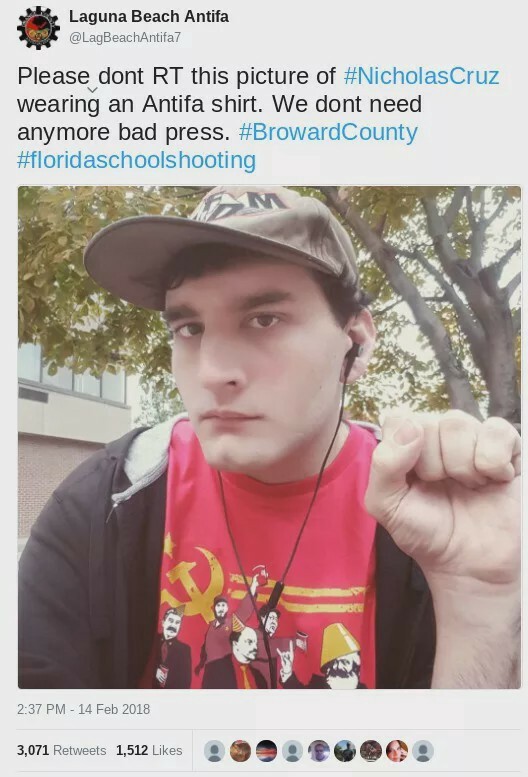 It also helps spread the meme that antifascists are explicitly communists or communist sympathizers. 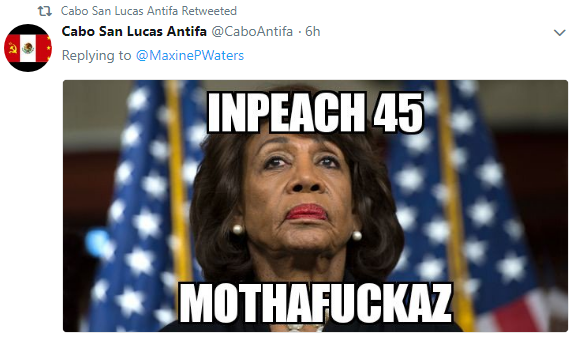 All told, if the supposed Antifa account is retweeting and/or tagging right-wing accounts, trolls, or their fake companions, they’re not really antifascists. You made it to the end! 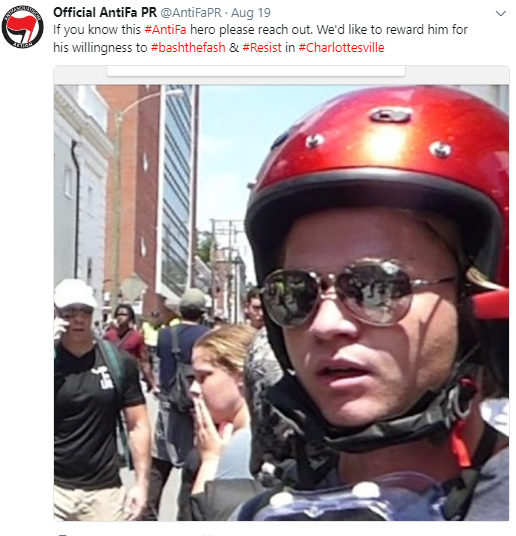 I hope this guide helped you better understand fake Antifa accounts and how to detect them on social media. If it did, please consider sharing this article with your social networks, so more people can be made aware of this shameful troll campaign. Thanks for reading, take care, and God bless America.